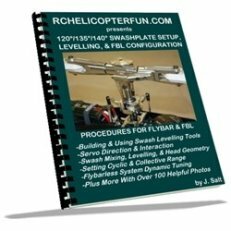 How is RC helicopter lift generated and controlled? Great question! Without lift after all, an RC helicopter or any aircraft for that matter won’t fly. For anything to fly – the amount of lift produced has to be greater than the force of gravity pulling it back to the ground. "Why Won't My RC Helicopter Lift Off?" Not enough rotor speed (head speed). Not enough rotor blade pitch angle (angle of attack). With those two points in mind, let's first look at how lift is produced by all wings and rotors. This should then help you understand and figure out why your heli is not overcoming the pull of gravity. The oversimplified airfoil diagram is only telling part of the story - a small part. All things that fly, from birds to supersonic aircraft and yes helicopters too, rely on airfoils (also called aerofoils) to create lift. How an airfoil (the shape of all wings, or rotor blades if looked at edge on) generates this lift is much more complex than the oversimplified low pressure above the wing theory most of us were taught in primary school, or even ground school for that matter. To fly an RC helicopter, plane, glider or quad-copter, you certainly don't have to fully understand all the physics going on here (as I said, lift it's complicated stuff). Not only that, covering all the fluid dynamics going on with airfoils is well beyond my ability and the scope of this article. There are plenty of other good "lift articles" out there already - here's one. 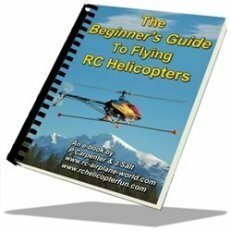 I'll just cover the simple to grasp concepts that are important in relation to our understanding of RC helicopter lift control. Hint - generalizations galore! Newton's second and third laws are arguably the primary contributors that explain airfoil lift. They are also the two that we have direct control over while we fly our RC helicopters. Newton's second law is commonly represented by the formula F=MA (force equals mass times acceleration). Applied to an airfoil, this can be interpreted as the lift of a wing being proportional to the amount of air diverted down times the vertical velocity of that air. Newton's third law states that for every action, there is an equal and opposite reaction. The action of the wing on the air is to force the air downwards while the reaction is the wing being pushed upwards. In short, an airfoil is a very effective air direction diverter or air pump. To simplify all that - if we want more RC helicopter lift, our rotor blades can either increase their velocity, divert more air (mass), or a combination of both. We will look at how this is achieved while flying our little egg-beaters shortly. I do however want to cover the second theory of lift. Partly because it's what many of us were incorrectly taught; and secondly because its the underlying principle responsible for one thing you have likely experienced while flying micro RC helicopters indoors. Bernoulli's theory as it applies to fluid dynamics, states faster moving air/liquid creates lower pressure due to the conservation of energy. Nothing wrong with that and it's proven. The misconception however is that Bernoulli's principle alone is responsible for lift, when in fact it's a small contributor. The second misconception has to do with the air molecules being forced to speed up as they travel over the longer top distance of the airfoil, to meet up at the same time with the ones below. This is known as "equal transit-time" and again, is a fallacy. Airfoils do not produce equal transit-time flow. The air flowing over the top of an airfoil is definitely moving faster than below. Much faster than the equal transit-time hypothesis would suggest as shown in this animation. Regardless of what causes the air to move faster over the top of the airfoil, and how low pressure above the wing is ultimately formed; low pressure above the wing has been determined to be a rather small component of total lift generated by a rotor or wing. For the average RC aviator, the argument is therefore moot. The majority of lift is generated from the redirected downwash airflow. Displaced cloud from wing induced downwash. If the majority of lift was in fact created by a low pressure area above the wing or rotor, there really should not be much, if any air movement below. If you've ever hovered your heli over your head, or watched a helicopter hovering over open water, snow, or a dusty surface, we know this is far from reality. There is a massive volume of air being pumped downward by the rotor system. 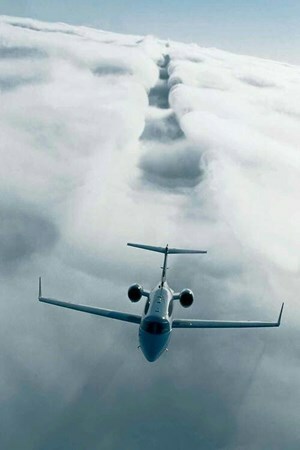 Plane wings are also pumping massive amounts of air downward as this very cool image illustrates. Low pressure above the wing creating all of the lift would also not explain ground effect. A flat slab of balsa still produces lift thanks to Newton's laws. Bernoulli's theory literally falls out of the sky when trying to explain how a wing can produce lift when inverted. 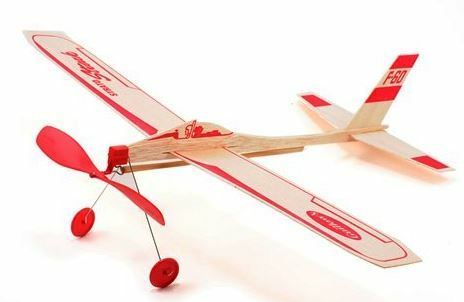 It also doesn't address how a totally flat wing on a toy rubber band powered plane that many of us had as kids, or even something as simple as a paper airplane can generate lift. So why am I still talking about Bernoulli's theory, and what does it have to do with your little micro RC heli? First, let's try a simple experiment right now to demonstrate Bernoulli's principle. Take a normal 8.5”x11” piece of paper and hold it between both hands length wise at the leading edge so the back edge of the paper flops down. Now blow down and across the top of the paper, at about a 45 degree angle. What happens? The back edge of the paper lifts up, even though you are blowing it downwards. That's Bernoulli's principle in action. Ever wonder why a shower curtain gets sucked inwards when you turn the shower on? The flow of water from the shower head is also creating faster air movement down the side of the curtain creating a lower pressure area inside the shower than on the outside. The result? The higher pressure on the outside pushes the shower curtain towards the shower flow. Which finally brings us to your micro RC helicopter. Have you noticed the walls or windows in your house almost seem to be magnetic when your micro heli is getting fairly close to them? No matter what you do, it's very hard or perhaps even impossible to overcome this strange magnetic wall or window attraction. It's a very real force the micro heli is experiencing, but it has nothing to do with magnetism - it's all due to Bernoulli's principle. Newton's second law we just learned about shows us how the velocity of this air flow is proportional to the downward air flow pushing the wing upward. Thus, the faster the air flows over the wing the more lift. This is a very basic explanation; there are other forces and factors involved such as drag, turbulence, flow separation, along with the shape of the airfoil that limit the speed of air over a wing and ultimately limit the amount of lift produced. The other component of lift is angle of attack or in helicopter control terminology “BLADE PITCH”. This is where Newton's 3rd law comes into play. As you angle the rotor blade or wing up (leading edge higher than the trailing edge) you start generating diverted downward airflow, which pushes the rotor blade/wing upward. The more you angle the rotor blade, the more air you divert downward and more lift is created. We call this positive or high angle of attack. What do you think we call it in the heli world? “Positive Pitch”. 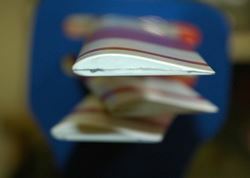 This picture shows a typical rotor blade edge on with a special RC helicopter tool called a pitch gauge measuring the angle of attack or pitch of the rotor blade. As you can see, this blade is showing a positive pitch angle of about +13 degrees. So now let’s take the airfoil and pitch idea one step further. If you look at the shape of that rotor blade airfoil in the above photo with the pitch gauge, it's identical on both sides. Thus the name symmetrical wing or rotor blade, same on the top and bottom. Having a symmetrical airfoil shape on a wing or rotor blade now means airplanes and helicopters can fly upside down. By changing the angle of attack or pitch to negative when upside down, the rotor now produces lift in the opposite direction – pretty neat. 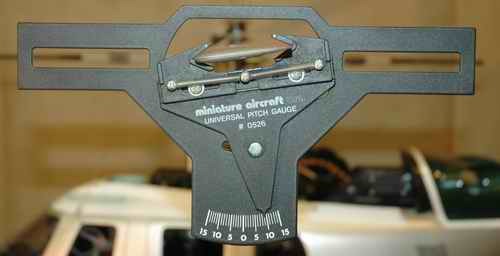 Here's our RC helicopter pitch gauge now showing a negative pitch angle of about -9 degrees. Because this is a symmetrical rotor blade, if the helicopter was upside down, the rotor would actually be creating a good amount of lift. I demo how this "negative" pitch change occurs in the video below. The rounded shape of the airfoil is responsible for keeping the air flow "bound" to the wing or rotor (boundary layer) as the angle of attack is increased - up to a point. If just a flat slab was used instead (like on our little balsa rubber powered plane), the airflow would easily separate above the wing, and create all sorts of chaotic turbulence, vortices and drag. That's exactly what happens when a wing stalls. It's also what causes that scary "fluffling" sound you get from your RC heli rotor when over pitching it during hard aggressive flying. Symmetrical airfoils like most of us are very familiar with on our RC helicopters are not as efficient at producing lift as a semi or flat bottomed airfoil. They are however capable of faster head and flight speed. The "under-cambered" airfoil takes lift efficiency to the extreme. This shape is ideal for light weight micro fixed pitch applications and produces lots of lift - they are sometimes called high lift rotors. Many toy & micro and coaxial RC helicopters use this type of airfoil rotor design. The obvious reason is because it produces the most amount of lift with the least amount of power, and has the least amount of weight (high lift to power & weight ratio). In our helicopter hobby, most fixed pitched helicopters (like our little micro coaxial above) will use under-cambered airfoils to create the most amount of lift for the amount of power available. As a result, smaller motors/batteries can be used for longer flight times and lighter helicopters. This is a good compromise seeing that fixed pitched helis can’t sustain inverted flight anyways. The speed of these fixed pitched blades is altered by you the pilot, to adjust how much lift is produced. Faster head speed - more lift. Slower head speed - less lift. Lift control by way of rotor speed adjustment can be somewhat vague, and imprecise because motors and rotors can't speed up and slow down instantaneously. Bad/weak battery (usually the most common culprit). Faulty motor (worn out, bearings shot, magnets shot, etc). Something dragging in the drive train, or overly tight/binding gears. Throttle channel output from radio too low (check your channel travel limits and throttle curve/s). If using a governor to control head speed, double check it's set for the correct head speed. With collective pitch, we change the angle of attack of the rotor blades while the speed of the rotor blade remains fairly constant to adjust how much lift is produced. Less angle of attack = less lift. Greater angle of attack = more lift. This method of controlling lift is both very precise and very fast. 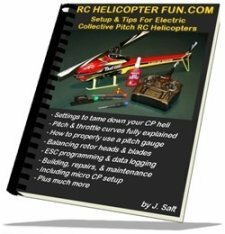 Speed of the rotor on collective pitch RC helicopters is also adjusted, but more as a way to control power output for a specific type of collective pitch flying. The majority of lift control on all collective pitch helicopters comes from adjusting the blade's angle of attack, not from the rotor speed (also referred to as head speed or rotor RPM). Tame normal flying for example we will usually be running lower rotor RPMs, because efficiency, docile flight characteristics, and longer flight times are preferred. Opposed to maximum head speeds used for fast & aggressive aerobatic flying (3D), when maximum power is needed over efficiency & longer flights. There are RC helicopters with collective pitch that use flat bottomed or semi-symmetrical rotor blades to benefit specific areas of flight, such as auto rotations, or specific types of flying such as scale where inverted flight is not usually performed. Once again, efficiency over performance! However, most out of the box collective pitch, single rotor helicopter kits will come with symmetrical rotor blades because they are the best compromise for all areas of RC helicopter control. 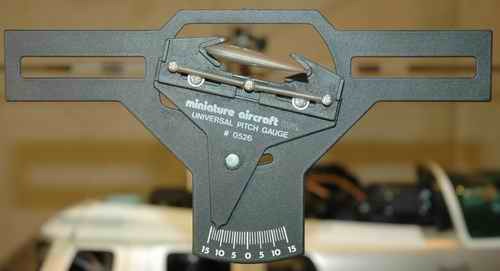 Confirm your collective pitch range with a pitch gauge! This is by far the most common reason why collective pitch RC helicopters are not producing enough lift - not enough blade pitch. Your manual should give you recommend collective pitch angles (set with your pitch curves), but most CP helis should be producing enough lift to hover at around +5 degrees of collective pitch. If none of that makes sense - my setup & tips eBook will explain it all. Not enough rotor speed. Same items to check as with fixed pitch. Newton's laws explain airfoil lift much better than Bernoulli's. Airfoils & positive angle of attack are required to produce lift. By increasing the speed of the wing or rotor we can increase lift (up to a point). By increasing the angle of attack or positive pitch of a wing/rotor, we also increase lift (up to a point). Lift is controlled exclusively by rotor speed on fixed pitch RC helicopters. Lift is controlled (mainly) by angle of attack on collective pitch RC helicopters. Simi-symmetrical, flat bottomed, and under-cambered airfoils are more efficient at creating lift than symmetrical airfoils. To fly upside down, we have to use symmetrical rotor blades and reverse the angle of attack (meaning it's positive while inverted). Most fixed pitch RC helicopters use under-cambered rotor blades, don’t require as much power to fly, and can't fly that quickly. 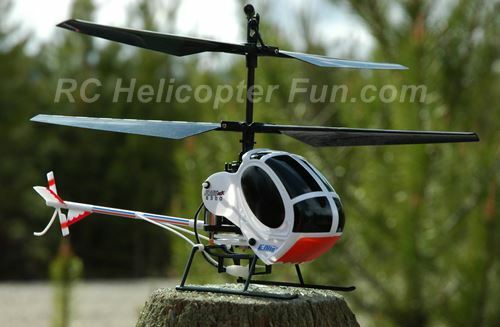 Most collective pitch RC helicopters use symmetrical rotor blades, need more power to fly, and can fly fast. 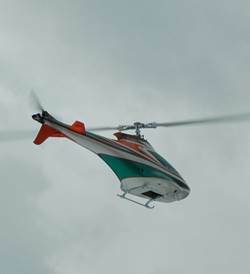 To lift off the ground or gain altitude, the helicopter must produce more lift force than the force of gravity pulling it down. To sustain a hover, the lift force must equal the force of gravity. The force of lift and the force of gravity are balanced. In this case the helicopter remains at a fixed altitude. To descend, the lift force has to be less than the force of gravity so gravity can pull the heli down. These are very basic examples of lift theory and how it applies to RC helicopter lift. As we examine more areas of flight theory in the Direction And Cyclic Control section, you will see there are many other forces acting upon the helicopter that cause the amount of lift being produced by the rotors to be changing constantly. This is why there is no such thing as a simple “up-hover-down” RC helicopter lift button on your radio or in a real helicopter – the dynamics are always changing and you have to keep adjusting the amount of lift produced to stay in control. Collective Pitch Lift Control Makes Precise Hovering Of This Beastie Possible.